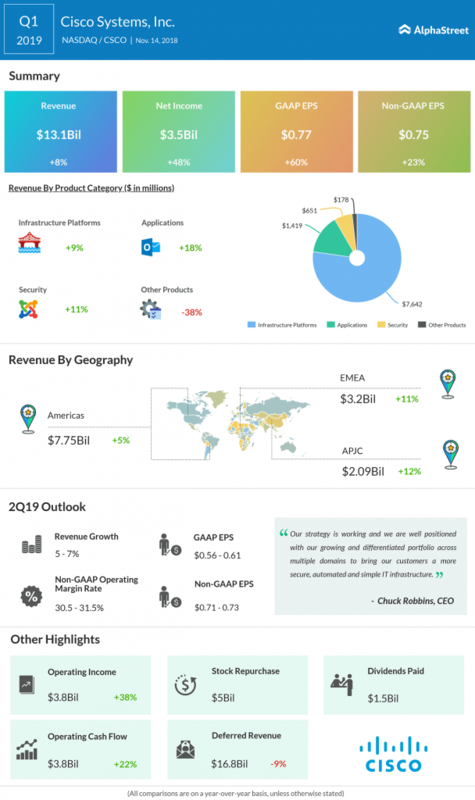 Earnings preview: What to expect when Cisco reports Q2 results? 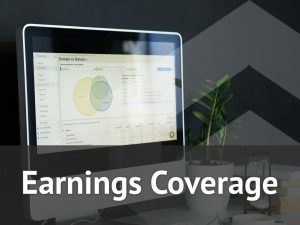 Cisco Systems Inc. (CSCO) is scheduled to report second-quarter 2019 earnings results on Wednesday, February 13. Analysts expect revenue to grow 4% year-over-year to $12.4 billion and earnings to improve by 12% to $0.72 per share. The company can be expected to beat estimates as it did last quarter. While some analysts have concerns related to the pressures from tariffs and its effects on Cisco’s third-quarter outlook, others, in general, seem positive on the company’s ability to prevail despite the challenges. Cisco enjoys a strong position and market share in network infrastructure products and it has seen good growth in its security business. In November, the company forecasted that over a period of five years, global IP traffic will more than triple and that global networked devices and connections will reach 28.5 billion by 2022. These forecasts appear to bode well for Cisco, and the company’s acquisitions of firms like Duo Security and the most recently concluded one, Luxtera, will help boost its capabilities in the areas of security and infrastructure. Cisco is projected to be well-positioned for moderate growth over the coming years. The majority of analysts have a Buy rating on the stock while the remaining have Hold. None have Sell. Overall, it appears one can expect positive results from Cisco. In the first quarter, Cisco topped market estimates with a revenue growth of 8% and an adjusted EPS growth of 23%. Revenues totaled $13.1 billion and adjusted earnings came in at $0.75 per share. The company registered growth across most of its product categories with a double-digit growth in Security. For the second quarter, Cisco had guided for a revenue growth of 5-7% and adjusted EPS in the range of $0.71 to $0.73. Over the past 52 weeks, Cisco’s stock has gained 19% and over the past one month, it has climbed 9%. The stock was up slightly by 0.31% in morning hours on Monday.